All structures, including critical civil infrastructure facilities like bridges and highways, deteriorate with time due to various reasons including fatigue failure caused by repetitive traffic loads, effects of environmental conditions, and extreme events such as an earthquake. This requires not just routine or critical-event based inspections (such as an earthquake), but rather a means of continuous monitoring of a structure to provide an assessment of changes as a function of time and an early warning of an unsafe condition using real-time data. 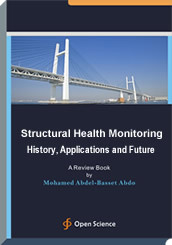 Thus, the health monitoring of structures has been a hot research topic of structural engineering in recent years. First, this work highlights the structural damage detection methods as a step of structural health monitoring (SHM) via discussing the differences between global and local damage detection techniques and the merits of each technique. Furthermore, it presents the interpretation of the localization of the derivatives of response-based damage detection methods. Next, the state of the art of different global damage detection methods and their applications are presented. Thus, vibration-based methods, static response-based method, physical model-based method, as well as implementation of long-term SHM to critical civil structures are discussed. Finally, the state of the art and the future of different types of response measurements and their applications in SHM of civil structures are reviewed. Also, some advances in measurement responses; such as laser doppler vibrometer (LDV) and fiber optic sensors (FOSs) are illustrated. General conclusions as well as recommendations for future research are presented. Professor of Structural Engineering (Analysis and Mechanics of Structures), Civil Engineering Department, Assiut University, Assiut, Egypt. He got Ph.D. degree in March 2002 from The Earthquake Research Institute, The University of Tokyo, Japan. He is a previous member of Japan Society of Civil Engineers. He got Prof. of Structural Engineering (Analysis and Mechanics of Structures) in 2012, Egypt. He has published more than twenty five papers in the field of structural engineering, structural analysis, earthquake engineering and structural health monitoring using changes in static and dynamic characteristics. He has reviewed many papers for different Regional and International Journals. He has worked as an engineering counselor for Al-Jouf University - Saudi-Arabia, for 6 years. The core audience for this book will be the researchers and postgraduate students. All researchers all over the world. Companies specialized in producing response measurements (sensors).